In the three-model Buick SUV lineup, the 2019 Buick Envision lands right in the middle in between the compact Encore and full-size Enclave. For many SUV shoppers, the Envision occupies the sweet spot in terms of size, not too big and not too small. 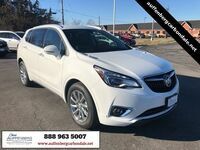 For the 2019 model year, the Buick Envision is available with a starting MSRP of $31,995 which is about $2,000 less than the starting MSRP of outgoing 2018 Buick Envision models. It’s a surprising move for Buick considering all of the upgrades and available features that have been added to the new 2019 Envision model. Learn more about the features you can expect to see in the 2019 Buick Envision below or click the link to head straight to the 2019 Envision inventory available now at the Auffenberg Chevrolet Buick GMC dealership in Farmington, MO near St. Louis. Like we mentioned above, along with the already healthy list of standard and available features found on the outgoing 2018 Buick Envision, Buick has updated the 2019 variation with even more available options to keep everyone comfortable and connected while on the go. Find a list of the new available features and upgrades added to the 2019 Buick Envision's resume below. The first 2019 Buick Envision models are starting to trickle into Buick dealerships nationwide and the Auffenberg Chevrolet Buick GMC dealership in Farmington has some available inventory. Get in contact with a Chris Auffenberg representative by filling out the form below and they can discuss pricing, availability, and setting up a test drive appointment. Of course, car shoppers are also welcome to browse the current Chris Auffenberg inventory in the comfort of home on our online inventory page. Interested in a 2019 Buick Envision?